Even if you care not a whit about Facebook and all the big plans Mark Zuckerberg announced at the F8 Developer Conference keynote today, your ears might have perked up at the sound of Giphy. Everyone knows Giphy as the premier app for sharing goofy animated GIFs, a genuine bright spot in a dark world. When the Facebook CEO announced the new Messenger Platform that now integrates a long string of apps into the chat service, Giphy was among the most popular. But the inclusion of Giphy also reminded people that this the first time the GIF service has even had a mobile app. Before today, you had to get your Giphy GIFs from the browser. So yay! 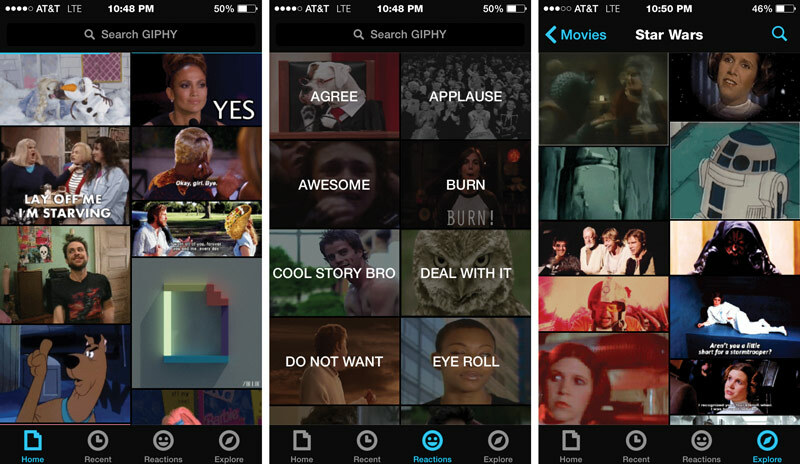 Giphy now has an app. When you download Giphy, for both iOS and Android, it conveniently appears as a separate app on your phone; it’s not embedded within Messenger, though it does have that little Messenger squiggle at the bottom, as all the chat’s integrated apps do — otherwise how would you know which ones they are? Launching Giphy brings you to an extremely busy modular home page filled with animated GIFs. You can search from the box at the top or scroll endlessly like the addict you know you are. But why do that when you can skip straight to the Reactions tab at the bottom of the window? Here, you’ll find all your favorite categories — Eye Rolls, Awesome, Seriously, Meh, the works. 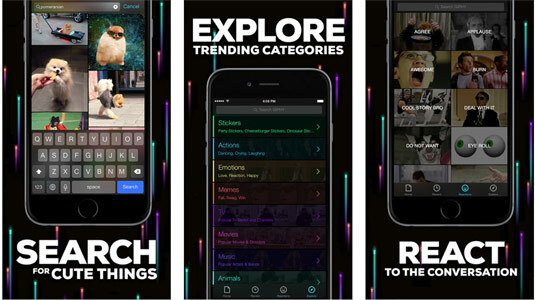 The Explore tab has all the Stickers, Memes, TV and Movie, Animals and other sections. And just like the browser Giphy you know so well, you can tap on any of the categories and see MOAR. Pick one, and you’ll also see related similar GIFs, just in case you’re feeling fussy. Tapping the share button saves that GIF to your camera roll. However you can immediately share the GIF (complete with an assortment of built-in hashtags) to any of your Messenger buds. A Recent tab keeps track of your madness. I’m happy to report that Giphy For Messenger is every bit as fun on the phone as it is in your browser, in a compact, streamlined, easy-to-use package. So now if you see people giggling into their phone while on the subway, maybe — just maybe — they’re checking out all the Giphys.